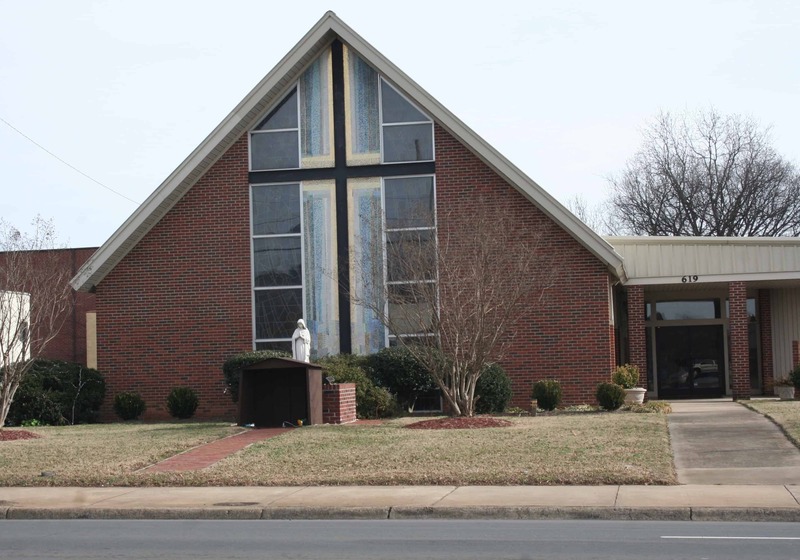 In January of 1944, Holy Rosary Catholic Church in Lexington was one of two Catholic Churches in Davidson County. At that time there were 100,000 people in the county, with less than 1 percent of the population being Catholic. The earliest known resident Catholics who came to Lexington in 1917 were Mrs. J. V. Brown and family, Mrs. Sylvia Leake Marsh, and Mr. J. Lance Crump. Prior to 1944, local Catholics traveled old route 29 to worship at Sacred Heart Catholic Church in Salisbury. In that year, a mission was established through the efforts of Charles Coira, a Catholic businessman. Father Thomas of St. Edwards Parish in High Point celebrated Sunday Masses in his home. Later in April of that year, Lexington became a mission of Sacred Heart Parish in Salisbury and was yet unnamed. Father Cletus Helfrich of Sacred Heart Parish was assigned pastor and celebrated Masses for about two years. When there were approximately 15 Catholics in Lexington in November 1946, Holy Rosary Parish was formally established. During the years 1952-58, industrial expansion brought more Catholics to Lexington. The corresponding growth took place under the guidance of Rev. Clarence Hill and Rev. Lawrence Hill. From 1952-54 Father Clarence Hill served as Pastor. In 1954, this mission was discontinued, and the membership was incorporated into Holy Rosary Catholic Church. In 1960, Father Peytus from Christ the King Catholic Church in High Point came to conduct a small African American Catholic Mission in the Ideal Funeral Parlor, where about 12 people attended. By the mid-fifties, the facilities of the parish had become inadequate. Construction of a new church and adjoining parish house was begun in the fall of 1957 with financial aid from the parishioners, the Ix Foundation and the Extension Society. The construction was completed during Holy Week of 1958 and dedicated by the Most Reverend Bishop Vincent Waters on July 16, 1958. At the time of the dedication, there were only 45 families. In 1958, Father James Keenan was assigned pastor. Mocksville became a mission of Holy Rosary and Thomasville became a mission of Immaculate Heart of Mary, High Point. Father Robert Shea was assigned pastor in 1963. It was also the first time that the Spaghetti Dinner was started to raise money for the Church—to purchase stained glass windows for the Church. The first dinner was held at The Lion’s Den on Carolina Avenue. It proved so popular with the community that it became an annual event. the black and white local Churches. They met monthly at the First Presbyterian Church to resolve the many issues at that time. In 1977, Father Anthony Silvestri, an Oblate of St. Francis DeSales was named pastor. At that time a mobile unit was purchased to accommodate the many activities of the parish. A statue of Mary was erected on the front lawn and a crucifix from the Oblate Seminary was given for the sanctuary. In June of 1978, the Swink property directly behind the rectory was purchased, later exchanged for the Allen property on 7th Street behind the VFW in order to create parking spaces. The Altar and Rosary Society was formed, and a very popular Christmas Bazaar was born and supported by the Lexington Community, which became an annual event helping to defray the expenses of the parish. The parish was blessed with two native sons who were ordained to the priesthood, namely Fathers Wilbur Thomas and John Greer. Oblate Father Joseph Travers became pastor in 1978. During his pastorate a building on 7th Avenue was purchased and used temporarily for Religious Education Classes until another building was purchased at 711 South Main Street, which was renovated to accommodate classroom space for Faith Formation, kitchen, and storage. The Building was named Our Lady of the Rosary Parish Center. In 1981, the Parish Church had the title changed, which became known as Our Lady of the Rosary instead of Holy Rosary. Father Travers added another building to the church, which is presently the sacristy. He also constructed the altar and pulpit that is currently being used. In 1988, Father Joseph Schaefer, an Oblate was assigned pastor. Under his tenure, the sanctuary was completely turned around; stained glass windows were installed, and a statue of the Resurrected Christ graced the Sanctuary wall. In 1988, the diocese took over the administration of the parish assigning Father Richard Hanson as pastor followed by Father Joseph Kelleher in 1991. In 1998, the diocese once again entrusted the administration of the parish to the Oblates of St. Francis DeSales, at the request of then, Bishop Curlin. On July 1, 1998, Father Albert J. Gondek was assigned as pastor and installed by Bishop Curlin on October 31, 1998. Under his leadership, the Church and Rosary Hall were updated and modernized, a parish house was purchased, and the former house was converted into administrative offices. Because of the influx of the Hispanic population in Lexington, an estimation of about 3,000, a Hispanic Community was born. On September 16, 1999, a Spanish liturgy was celebrated for the first time. The Church was filled to capacity and continues to be so at our weekly Spanish Mass. In August 2006 two Sisters of Providence of St. Mary- of- the-Woods, Indiana arrived and began to minister within the parish. And in January of 2016, Father Ambrose Akinwande, MSP became the Parochial Administrator and installed pastor in October 2017. With renewed hope and deep faith, we move forward to continue the Lord’s work in our life time. With God’s help we will accomplish the good work that he has begun in us. • 1971 Rev. Anthony Silvestri, O.S.F.S. • 1978 Rev. Joseph Travers, O.S.F.S. • 1983 Rev. Joseph Schaefer, O.S.F.S. • 1998 Rev. Albert J. Gondek, O.S.F.S.